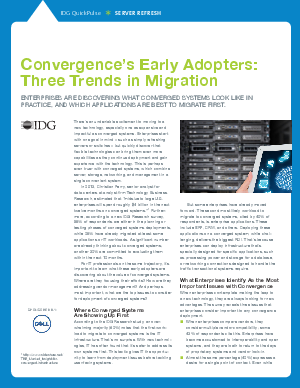 A new IDG Research study reveals that IT professionals are already seriously considering converged systems. The advantages of converged systems are clear. Still, some reticence remains due to concerns about cost and ROI. Learn how converged systems bring value to the enterprise today and tomorrow, and see how Dell PowerEdge FX solutions smooth the road to convergence.